Are you looking for ways to run your warehouse more smoothly? Even the best-organized bosses can always change their system a little bit to get the most out of their workers. A warehouse is usually just one building, but in that building is a connected system of employees, machines, tasks and other work-related items that all interact with each other. Finding out how all those things work together the best way possible is hard to do. It helps to have a system in place. This “plan of attack,” which is sometimes called Management Best Practices, can help your warehouse become more efficient – and not to mention, simply a better place for everyone to work at. Speaking of safety…if your company needs OSHA compliant forklift training and certification, CertifyMe.net offers a comprehensive selection of courses. Remember, even the best warehouse management best practices are useless without properly trained forklift operators and well-trained employees to make everything work. Get started today, and see how our safety training can help improve your warehouse’s productivity and safety. Let’s look at some different techniques used by managers, supervisors, and other management personnel to effectively run – and simplify – what can be confusing and chaotic environment: a warehouse! Looking to elevate your warehouse’s efficiency, safety, and overall productivity? It all starts with a common-sense management style, along with a few guidelines to ensure everyone is doing their part toward a singular goal. These Management Best Practices (MBP) will benefit supervisors, regular employees and everyone else in your warehouse organization chart. Keep Communication Open. If there is any issue with a warehouse delivery, forklift problem, anything at all – have your employees communicate directly with management. If workers have a voice, they’re happier. Offer Incentives. For example, if your forklift driver has gone 6 months without any accidents or close calls, offer a bonus. Other effective incentives include rewards (gift cards, extra vacation days, etc.) for things like following safety procedures and regular maintenance schedules. Get creative with your warehouse management incentive plan – you’ll be surprised how easy it is to have a well-run warehouse. These invectives make it easier to have a safer, healthier workplace. Be friendly – but not too friendly! Effective warehouse processes and procedures require a firm guiding hand. Sometimes, tough decisions are necessary to comply with demanding standards. For the leadership in charge of management best practices, remember that you’re a leader – not necessarily everyone’s best friend. Set Realistic Goals. If your warehouse benefits from handling a certain volume of goods, put up a number for yearly goals. Also, aim for a certain amount of accident-free days. All these small goals will help accomplish a larger goal – a better warehouse to work in. Recognize existing problems. In order to fix any problems with your warehouse, you first have to identify what they are. From challenging product and cargo management to poor logistical support, your warehouse can always improve. Conduct an honest assessment (feedback from employees, third-party audits, etc.) 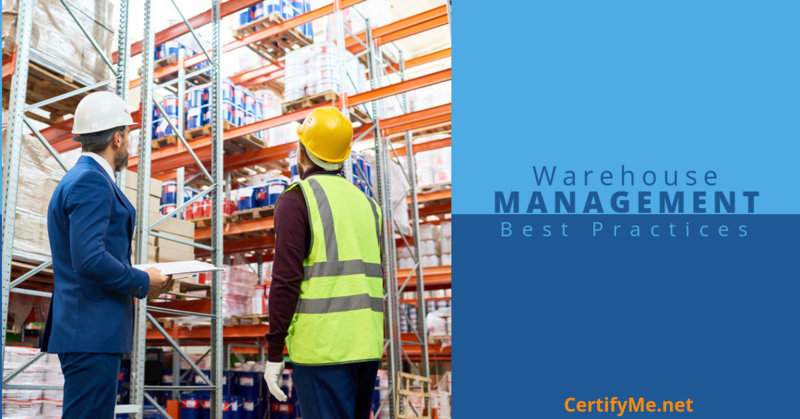 to focus on areas where management best practices are applicable to your warehouse. CertifyMe.net is also a big part of many warehouse MBP plans. Our affordable training classes, including warehouse forklift training, are a great way to have your entire forklift driving fleet become OSHA compliant in the quickest time at the lowest cost. After all, there are plenty of famous American companies (Verizon, Jenny Craig, Fuji Film, Harley-Davidson, Siemens and others) who rely on CertifyMe for all their forklift training needs. CertifyMe.net will keep you OSHA compliant – that’s the bottom line! Please call (888) 699-4800 to set up your training courses today. For other ways to reach us, or to send a secure message, just visit our contact page. If you’re ready to get started today with your company’s forklift training and certification program, click here. Thank you for checking out the CertifyMe.net blog. Please check back for more information related to forklift safety, warehouse process improvement, and much more.